Coos Cues proudly supports the Billiard Education Foundation and our youth! Having been an avid player since the age of 12, I was always fascinated with all things pool and wood in general. But I knew nothing about the construction of pool cues other than I knew what looked good to me and what felt good. Later in life I bought my first custom cues and started to study how they were made. Next I decided to make my goal to play with a cue that I had built myself. I bought a second hand lathe, a book and some tapes on how to do it and went to work. After completing that project and some bar stick conversions I was hooked. That first playing cue is in the photo here and I gave it to my son after playing with it for a couple of years. Hopefully he will pass it on to his son or daughter. Goncalo alves is extremely stable and hard. These cues break like a hammer! Notice the red white & blue theme? I have made many of these and people seem to love them! John builds a wonderful cue! Everything I asked for was customized to my specs. 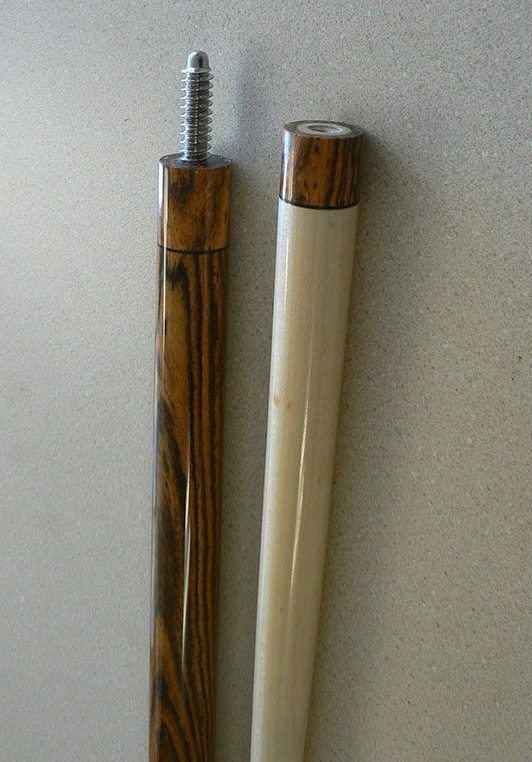 My cue is 60 inches long with olivewood forearm, cored with purple heart and a walnut handle (absolutely beautiful). Around 18.8 oz. with simple ring work, 2 shafts are 12.75 and a 14 inch pro taper as requested and a 6 inch extension. Cue hits amazing and shafts are smooth as ice. John kept me informed throughout the build that took around 4 months. I was so pleased I ordered a break cue through him that breaks great at a very good price. Can’t go wrong with Coos Cues. Thanks for everything and looking forward to future business with you. Hi everyone. I have had a lot of custom built cues in my career, and these Coos cues are extremely well built. I really appreciate the exotic wood and performance of their cues, and I have had 6 of them built. I personally own 3 and had one made for my wife and son They even picked out the different types of wood for the cues. I gave friends of mine the other three as gifts. I love my cues and use them almost every day for the past three years with no issues with the performance or wear. Thanks John for the fine quality and appreciation of building great cues!!! I absolutely LOVE my new cue from John Chaplin of Coos Cues. The hit is so solid and I’m getting great action with it! In addition, it’s amazingly beautiful. The spalted tamarind you used is unique and the deep, rich ebony accentuates it perfectly. The only problem I have with the cue is other people are always asking to hit with it, and it’s difficult for me to get it back from them! My first pro competition with the cue will be at Super Billiard Expo in Philadelphia in March! I’m so excited about this year and competing with this cue! Thanks again! You’re the best!